Held at the Academy’s campuses and locations around the world, the summer 3-Week Filmmaking Camp for teens is film school distilled to its essence. Students experience each aspect of the filmmaking process from creating the story to screening their finished film for an audience. The 3-Week Filmmaking Camp for teens is structured around the production of two short films of increasing complexity. Students’ days are spent either in class or on set learning how to apply what they’ve learned from their expert instructors in supervised workshops. Each student writes, directs, shoots and edits his or her own films using a professional HD digital video cameras and industry-standard digital editing software. Through a series of hands-on and intensive classes on production, editing, writing, cinematography, and directing, we provide students with an introduction to the various creative and technical demands of filmmaking. During the camp, students have each one of their films screened and critique in class with their faculty member. Director’s Craft: Students are taught the language of filmmaking and the director’s craft as applied to the digital format. Writing: This class teaches basic screenwriting structure, and works to build a structural understanding of story. Students work to formulate their film ideas in this class. Hands-On Digital Camera and Lighting: Classes will help students master the digital medium including white balance, shutter speed, focus, video latitude, gels, and filters. Production Workshop: This class is designed to demystify the craft of filmmaking through in-class exercises shot on film under the supervision of the instructor. Digital Editing: Students learn to “log and capture” their digital footage into industry-standard editing software. Working with Actors: Students get instruction and practice in language, technique, and etiquette useful in pulling effective performances from actors in their projects. Students work in four-person crews to complete each film. Every student directs two films. When their colleagues direct, students rotate among the essential crew positions of gaffer, assistant camera, and director of photography. Every week is devoted to writing, producing, directing, and editing a different film project. Students work in four-person crews to complete each film. Every student directs two films. When their colleagues direct, students rotate among the essential crew positions, including gaffer, assistant camera, and director of photography. Continuity: Continuity is one of the fundamental principles of modern filmmaking. Students are challenged to make a film that maintains continuity in story, time, and space. Utilizing a variety of shots (10-15) in a continuous sequence, the action in these films should unfold seamlessly with no disorienting jumps in time or space. Music & Image: Students will explore the unique properties of the digital format. Students will plan their projects meticulously, and then improvise and utilize the best aspects of the digital medium. The light weight of the camera makes for great ease of hand-held camera movements. Low light level shooting is possible in such a way that the camera can record very sharp images in a wide variety of environments. Students will take their digital cameras into places where film cameras and film crews would not have easy access. Experimentation in the editing room will be encouraged as students explore the advanced functionality of digital editing software. At the end of the camp, the final films are celebrated in a screening open to cast, crew, friends and family. All students who successfully complete the 3-Week Filmmaking Camp receive a New York Film Academy certificate. 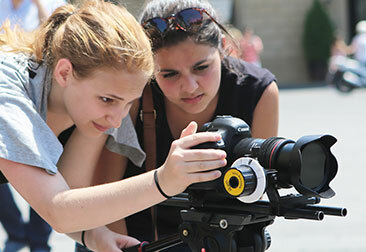 Curious to learn more about the 3-Week HD Filmmaking Summer Camp for Teens? Click here to learn more about the application process.